As you know, Encrypt Files is free product. But, some users need more. Some users want specific options, some want to clear accumulated evidences of their surfing history, some want to hide their files and folders so their family members can not discover it. Then, there are corporate users that may want powerful systems that work through their networks or call back functionality that mails or sms them outside job place whenever something happens. So, we put a little effort to find available commercial software, review it whenever possible and put it on this pages. We hope it can help you if your specific needs excel what Encrypt Files has to offer. Important thing to note, we are not makers of this software and can not make any guaranties about its quality, we just gave our marks based on our experience with this of software and what we think a good piece of software is. Packed with its Hidden Secret Folders for downloaded files, with Secret Bookmark, with complete Manual Clean Up Editor and with Active Shred Editor - Shadow Professional is premiere, full featured and extremely reliable solution for anyone who wants to take care of their own privacy, whether in home or office. This software package got practically everything you might need to cover up traces of your online activity. Shadow Professional is not a program to encrypt files although it has nice hide folder option. What is particularly great about this program is its ability to selectively cover up activity tracks - you want to visit some "tricky" website, you press start, surf, press stop and voila.. there is no evidence you have been on "tricky site" but your internet history is not deleted.. just the "tricky" part of it. 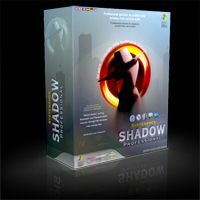 Shadow Professional does have alot to offer for someone who wants to sleep better after surfing in "gray" zone and if that's what bothers you we can highly recommend this program. Quite impressive. SuperEncryptor is a professional but easy encryption tool with friendly user interface, and shares the basic operation like Windows Explorer. It provides comprehensive data storage and protection for your files by our unique features. This program have few unique features. If you easily forgot your passwords or dont want to write them down for some reason there is a feature to use disk, or any type of file as a password. It is probably easier to remember the location of a file than password.. anyways quite a nice option to have. You can also hide an encrypted file inside another file, for instance put your encrypted document inside mp3 track, or even family photograph. Those "host" files continue to operate as normal, and if your "parasite" files are not to big we really dont see how someone could ever get a clue what you have did. You can hide folders in several ways, manage passwords, protect exe files and many more. This is one of those programs that, sporadically looking does not look promising but actually are more featured than some some "big boys" out there. Any employee of the Internet Service Provider (ISP) that you you use, can tap into your e-mail at your end or that of the recipient with the use of fairly basic equipment. Tapping can also be done by anyone who links up to the dozens of Internet routers through which your message passes. The mail can even be accessed by someone at the phone company's office or a hacker who taps in through them. This is like our free "Encrypt Files" on steroids. On a lot of steroids. From the eye candy like 13 skins to choose from to the great email encryption support this is one strong package. A lot of well thought features are there, like integrated "common passwords" database that prevents easy cracking your encrypted files. All functions expected from high calibre encryption software are there: public/private password support, email encryption, self extracting exe.. even things like command line utility and internet history traces remover. Visit their home page for complete feature list. If you need more than what "Encrypt Files" has to offer you can not go wrong with this package. Highly recommended. Drive Encryption is the best encryption solution. It's easy to use and helps you encrypt the disk drives which are using FAT or NTFS File System so faster that few seconds is enough for encrypting or decrypting 200GB Hard Disk. The Encryption Algorithm is 256 Bits AES. Drive Encryption supports all kind of Fixed Drive and Removable Storage. For example, Hard Disk, USB Hard Disk, USB Flash Memory Disk, PCMCIA Hard Disk, PCMCIA Flash Card, Memory Stick, CF/MMC/SD/xD Memory Card, Floppy/ZIP/JAZ Disk, etc. Most commercial encryption programs are either file/folder or whole disk encryption. This program does just that: it uses todays standars AES encryption to encrypt your whole disk at once. It that is what you need this little program will do it safely and it costs fraction of price of some overpriced products that does the same thing. 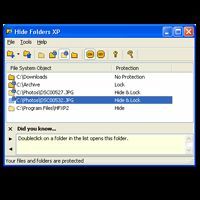 Hide Folders® XP is a simple but ingenious program for Microsoft Windows XP and 2000 users. Every day we trust our personal files to a computer. Who knows how many people will want to get access to them? If you share your computer with coworkers, children, spouse or your computer is always connected to the Internet, your private files are under threat of being revealed. Since 2001, our Hide Folders software products help our users to hide private files and folders from prying eyes. Simple, relatively inexpensive proggie to hide and/or lock folders on your system. If all you want is to make your choosen folders invisible from your family or coworkers on job this program will do the job. Privacy Eraser is an Internet Eraser that protects your Internet privacy by cleaning up all the tracks of your Internet and computer activities. Our Internet Eraser supports popular web browsers such as Internet Explorer, Mozilla, Firefox, AOL, Netscape, Opera and MSN Explorer. In addition, Privacy Eraser Pro supports free plug-ins to extend cleaning features, you can easily erase the tracks left by any applications and make your own plug-ins. Privacy Suite allows you to erase and destroy data with methods that exceed the US Department of Defense standards for file secure erasure (DoD 5220.22).